We are located on the beautiful UC Davis Campus in Davis, CA. The nearest intersection is La Rue Rd. & Crocker Lane. Meyer Hall is to the west of us. The cost of a daily parking pass (Monday-Friday) is $9 per vehicle. Handicap and weekend parking is free. The closest Visitor Parking lot is 47, but this is often full. The other option is parking over in the Gateway Structure** and lots P1 & P2 next to the Mondavi Center. For weekend events at the Bohart visitors may park in Non-Visitor Parking Lot 46, which is adjacent to our building. Alternatively, there are two free 30-minute parking spots right in front of Academic Surge, but these are first-come, first-served. 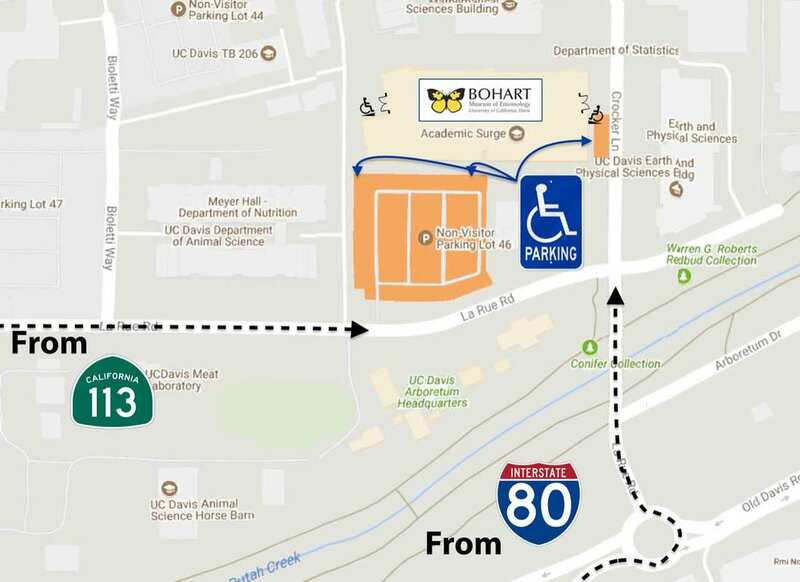 The last area that offers free short-term parking is the loading bay (where the dumpsters are), which can be accessed on Crocker Lane near the east entrance to Academic Surge. There are also two metered parking spots on La Rue Road near lot 46, which take dimes and quarters and allows for 45 minutes (dimes give 4 minutes, quarters give 10 minutes). **If you are parking on campus Tuesday-Thursday between the hours of Noon-5pm, you can take advantage of the Manetti-Shrem Art Museum parking kiosk in the Gateway Structure. This offers you a 2-hour parking pass for only $3.00, but this is only available during Manetti-Shrem Art Museum hours. Click here for a the art museum's map for parking. Free handicap parking is located along Crocker Lane and in Parking Lot 46 next to the museum. If handicap parking is occupied, visitors with the appropriate handicap placards can park for free in any open spot that isn't reserved for a specific vehicle (eg gov't service vehicles). Warning: Bridge construction has shut down the pedestrian path across the La Rue Road/Old Davis Road bridge north of the traffic circle. Cars can still use it, but not pedestrians. Please use this alternate route above if you are coming from anywhere in the Gateway Structure or Parking lots 1 or 2. Click here for more information about the construction.